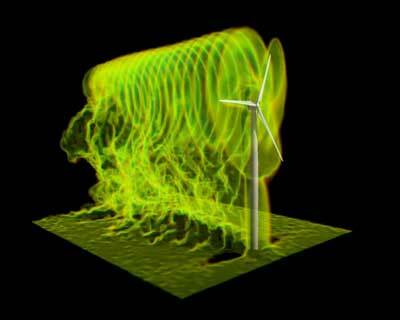 (Nanowerk News) Every two and a half hours, a new wind turbine rises in the U.S. In 2016, wind provided 5.6 percent of all electricity produced, more than double the amount generated by wind in 2010, but still a far cry from its potential. The team reported their findings in Wind Energy ("Parabolic RANS solver for low-computational-cost simulations of wind turbine wakes") and Renewable Energy ("Model-free control of wind farms: A comparative study between individual and coordinated extremum seeking"). In the branch of physics known as fluid dynamics, a common way to model turbulence is through large eddy simulations. Several years ago, Stefano Leonardi and his research team created models that can integrate physical behavior across a wide range of length scales -- from turbine rotors 100 meters long, to centimeters-thick tips of a blades -- and predict wind power with accuracy using supercomputers. The development of the fluid dynamics model for wind turbines was part of an international collaboration between four U.S. institutions (Johns Hopkins University, UT Dallas, Texas Tech and Smith College) and three European institutions (Technical University of Denmark, ?cole polytechnique f?d?rale de Lausanne and Katholieke Universiteit Leuven) funded by the National Science Foundation.